After the initial shelling or cracking, our cleaner cleans pecans, English walnuts and peanuts at over 100 pounds per hour. Portable, lightweight and easy to use. Low load height, variable blower speeds and variable speed feeder control. Adjustment for average nut size. 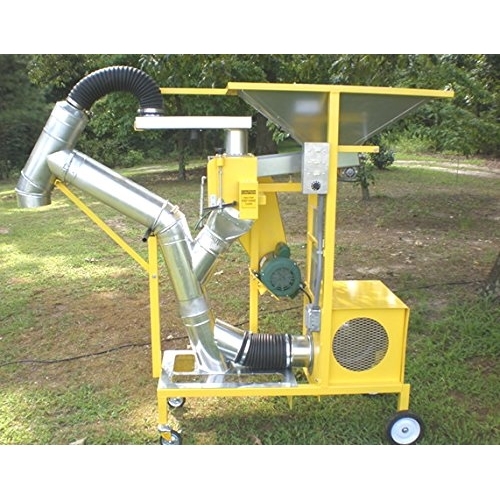 Your shop vac attaches easily for dust removal. Plexi-glass chamber prevents outside debris from entering cleaner while providing view able area. 85-90% of nuts are completely clear and cleaned of hull. These features make our equipment the most versatile and user friendly on the market today.